Editorials from Theslowlane: Fairhaven, inside the folding real estate bubble? Fairhaven, inside the folding real estate bubble? With much of Bellingham's Fairhaven District getting so pricey, riding that retirement real estate bubble, there's signs the bubble's aging. Nationwide and even here. How long can the bubble inflate? Dow dropping, sub prime rates ending. Was it over priced to begin with? Left behind, so much of America that people cherished. Even in the midst of "high end city," there's still the empty storefronts. 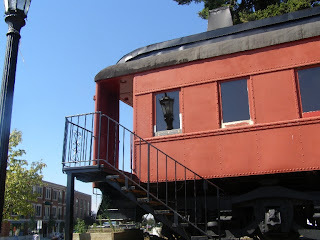 I walked past these old rail cars. They've been parked for years in a circle. Held small businesses, but seem to be empty now. I am not sure what the story is, but I have also noticed quite a few empty storefronts in many of the new condominiums around town. People living upstairs and shops downstairs, but how many trinkets can the shoppers absorb? Then I hear a large percentage of the condominiums, maybe half, are actually used as rentals. Good news for those of us who rent. Can the bubble remain pumped up before it implodes. Having the shop keeper live above work is a good idea, but the market is still holding up the malls also. Can those who work downstairs afford to live upstairs? An empty space doesn't pay inflated mortgage, but it allows one a memory of things beyond "the bottom line." More recently, 2009, rail cars have been moved out of Bellingham's Fairhaven district. Property owner wanted to have them hauled away to make way for another development. Someone back east has taken them away for the cost of shipping. Plans to make use of them in Whatcom County have fallen through.